The performance perspective of business processes is concerned with the definition of performance requirements usually specified as a set of Process Performance Indicators (PPIs). Like other business process perspectives such as control-flow or data, there are cases in which PPIs are subject to variability. 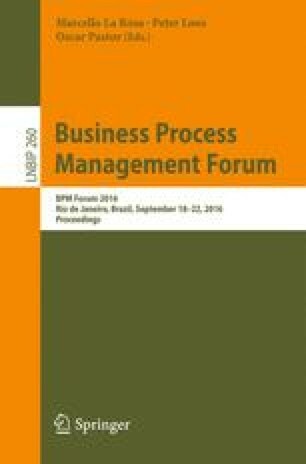 However, although the modelling of business process variability (BPV) has evolved significantly, there are very few contributions addressing the variability in the performance perspective of business processes. Modelling PPI variants with tools and techniques non-suitable for variability may generate redundant models, thus making it difficult its maintenance and future adaptations, also increasing possibility of errors in its managing. In this paper we present different cases of PPI variability detected as result of the analysis of several processes where BPV is present. Based on an existent metamodel used for defining PPIs over BPs, we propose its formal extension that allows the definition of PPI variability according to the cases identified. This work has received funding from the European Commission (FEDER), the Spanish and the Andalusian R&D&I programmes (grants TIN2015-70560-R (BELI), P12–TIC-1867 (COPAS) and P10-TIC-5906 (THEOS)).